Morgan James Faith, 9781642792201, 206pp. In November 2004, Lora Jones was a happy wife and proud mother of two beautiful children. Lora and her family left for a family vacation, excited to celebrate the holidays, but sounds of music and laughter in their van were shattered by a head-on collision. Lora watched helplessly as, one-by-one, her beloved family slipped into eternity. Awake in a nightmare, all traces of laughter were replaced by the mournful cries of a wounded heart. How in the world could Lora go on alone? 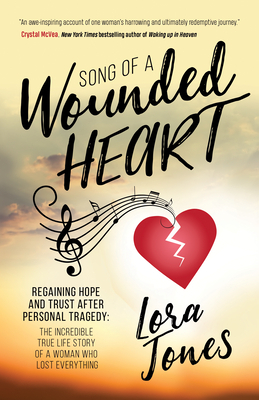 Song of a Wounded Heart tells the true story of Lora's journey from death to hope. Unbelievably, God sang to her the night of the accident. "Do not be afraid," He whispered, "This is for my glory." How could that be possible? She was crushed under the enormous pain, unable to think. In the months to come, as she struggled to understand, God patiently continued to sing, drawing her gently to His side, daring her to trust Him. Lora shares her personal journal entries, including the Bible reading plan God used to speak to her and stories of people in the Bible who also struggled with faith. Join Lora in Song of a Wounded Heart as she asks God questions, deals with anger and loneliness, and chooses to believe in the goodness of God, in spite of the circumstances.